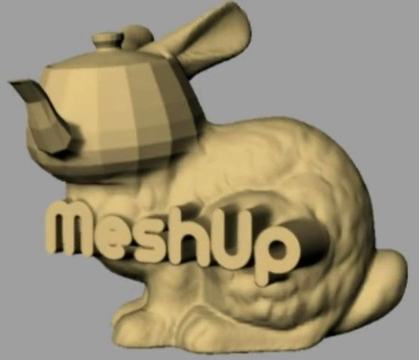 A mashup of two classic STL datasets, the teapot and the bunny, done using MeshUp. Proposed features of MeshUp include the ability to merge meshes from multiple sources, the addition of microstructures to aid in the structural integrity of 3D printed parts, mesh repair, and guaranteed watertight output for 3D printing. It is important to note that MeshUp would be a standalone version of Symvol, a plugin for Rhino that has many of the same capabilities. Robert McNeel & Associates, the Rhino3D people, announced the availability of openNURBS 5, their free toolkit for 3D geometry exchange using the 3DM file format. When it comes to faceted geometry data exchange, the simplistic STL format is king. OpenRP was proposed as an improvement and now along comes AMF. PTC is offering Mathcad Express for free. FDS, the Fire Dynamics Simulator, is a LES code for low-speed flows especially those with smoke and heat transport from fires. Version 6 is ready for beta testing. Visualising Data presents their best of the visualization web list for September 2012. NAFEMS is offering a 2-day course on Introduction to CFD Analysis: Theory and Applications on 26-27 Nov 2012 in Wiesbaden, Germany. The next 3D Collaboration and Interoperability Conference (3DCIC), dedicated to fostering improvements in the exchange of 3D design geometry, will be held 21-23 May 2013 in Colorado Springs. Cadlog Srl was announced as the Italian distributor of Mentor Graphic’s CFD products. Siemens PLM will acquire LMS International. Researchers are using CFD to study motorcycle aerodynamics. This is not any old motorcycle – it’s Jet Reaction on which a rider will attempt a 425 mph speed record. 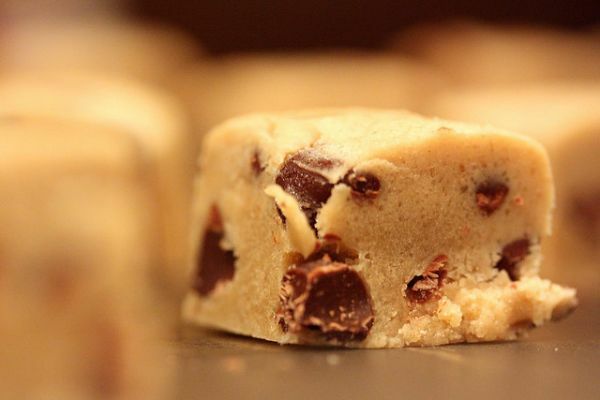 How will this cookie dough change shape under heat stress? This is science you can sink your teeth into. [Poor joke but it had to be written.] I suppose within CFD only a mesh generator would be interested in the morphology of various materials and shapes so this study may have limited interest from that standpoint. However, in a beautifully illustrated study it is made clear that cookie dough loses its morphological integrity at a temperature of about 375 deg. F with about a 100% area increase and a 25% increase in circularity. On ENGINEERING.com, Chad Jackson writes about a post on LinkedIn in which the poster opines that having engineers use CAD software to make drawings was not an effective use of their time. Back in the day, draftsmen [draftspeople?] would create drawings and would cost the company much less than an engineer. Now engineers get paid to do CAD. Geometry, usually from CAD, is central to CFD. And at the same time it’s hugely problematic. For a while now I’ve been ruminating on a geometry-centric post here. My experience is that most CFDers don’t use CAD. Do you agree? If you had to, would it be a waste of your time? A screen grab from Ruslan Khasonov’s typography made from carefully placed water droplets. 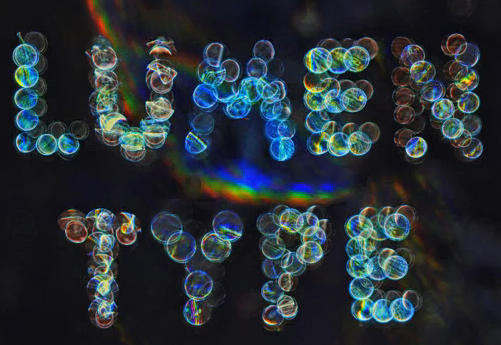 Inspired by seeing the world through raindrop covered eyeglasses, artist and designer Ruslan Khasonov created Lumen Type, a typeface made by carefully placing water droplets on a mirror and photographing them under various types of illumination. Be sure to watch the video. This entry was posted in Applications, Events, News, Software and tagged Math, Mentor Graphics, PTC, Rhino, Siemens PLM. Bookmark the permalink. On a different topic, I thought I would leave this comment here as a means of sharing my thoughts as an aerodynamics engineer in regards to the North American Eagle project. I watched the webinar, well mostly the replay since I got to the live one late. Clearly a lot of effort went into all of it, and some, if not many, have devoted volunteer time to this. This is very commemorable. In the time I have to write this, I can not state all the positive feelings I have. And, I don’t want to detract from the project. I do not have any inside information, and I could not read the Lift Force Table since the font was too small/blurry, so my statements are a fly by the seat of my pants hypothesis. But, I’ll be honest, it leaves me walking away not really feeling jazzed. And, a really cool part of the story, the analysis and design of the rear fairing, may have been missed. After all, that is where CFD and all this other computer whiz bang stuff (i.e. rapid modeling and grid generation) REALLY shines. Quick exploration and redesign when unexpected, or unwanted, results are encountered.. If someone would like to leave comments, maybe (depending on the comments) NAE’s facebook page is a better place to put them since I also commented over there. Thanks for the feedback and your interest in the NAE project. Let me clarify that the purpose of the webinar was mainly to bring attention to the NAE project and to promote the fact the Pointwise and Ensight are two of the tools chosen for their aero analysis. Furthermore, 30 mins (the other 30 is for Q&A) wouldn’t be enough time to get into a detailed aerodynamic analysis. Regarding your comments, I think it would be more constructive if you spoke directly with the team members about your thoughts and observations. More importantly, I sure they would welcome your direct participation rather than from commenting in a blog or elsewhere. Please contact Darren Grove directly about participating. In regards to your second paragraph, I’m quite capable of making my own decisions on how to participate in the field of aerodynamics and CFD. My comment was not intended to tell you where you can or can not participate. Re-reading that paragraph, I can see how it might have been misconstrued that way. My intent was not to discourage you from commenting on our articles. Apologies. I was simply encouraging you to speak with Darren about your insights and possibly participate with them on the aero analysis. Martin: It seems to me that you inferred something from Chris’ comment that wasn’t implied. I believe all he’s saying is that the aero guys at NAE would benefit from (and welcome) a direct dialog with you on this topic. So lets dig into some details. Your hypothesis was correct wrt the underneath aft axle fairing being “chocked”. Keep in mind that this was my first attempt at making some fairings around axles, wheels, parachute cans, and linkages that was designed and built from previous work. In other words, it wasn’t from a clean sheet of paper. But as you stated, CFD is a “whiz bang” tool for doing rapid modeling and grid generation. I could argue the point it’s not that simple as many people believe it to be. A lot depends on the assumptions, knowledge of the tools and knowing the limitations, and experience. But I won’t bore the readers here. OK, back to the good stuff and to answer your questions. If you can refer to the Webinar video or go to the NAE web site, you can see that the fairings covering the rear axle (from a planform view) are like little wings. Support linkages in around this area drove this design. If you took a cross sectional cut, you would see that it is mostly a symmetrical airfoil (no camber). This design was intentional just as a first round to see what it did. As you guessed, and as I suspected would happen, the airflow underneath the car gets “squeezed” and as the speed increases becomes chocked. A strong shock forms underneath between the fairing and ground plane. This shock is pretty much normal between the ground plane and at the maximum thickness (where the axle is housed inside the fairing). There is a large amount of energy in terms of pressure losses across the shock, giving raise to wave drag. The pressure buildup in this region, as I pointed out in the Webinar, is one of the contributing factors to the increase in lift on the axle fairing. This would be a good time to discuss my nomenclature of the FM_BVFA (Full Model – Body, Vertical tail only running Free Air, i.e., no ground plane) and FM_BVGP (Full Model – Body, Vertical tail only, with ground plane). So these geometries are different from the FD1 in the fact that they have NO suspension systems (front, middle, aft). The objective of this study was to simply see what kind of effect on lift & drag the car would feel with and without ground plane proximity, a delta if you may. To me, it was very interesting to see that with a ground plane, the down force on the car was greater and increased with speed. Intuitively I would have thought opposite, due to pressure buildup underneath the body. Getting back to the FD1 simulations. I, with the help of EnSight scripts, am definitely looking at the roll, yaw, and pitching moments. Working with a car’s stability and control is different then airplanes in the fact that we are not trimming the aerodynamics about the CG only, but looking at the tip over rotational axis, and moments about the wheels. The CG plays an important roll when making sure the car has enough positive yaw margin, i.e., if the car experiences a cross-wind or the pilot puts the car into a slight yaw, that the side forces wants to point the nose of the car towards the direction of the oncoming wind. To wrap things up, the FD1 will not work for our objectives. At transonic speeds, multiple shocks start forming in around the aft fairing, struts, vertical tail, causing a lot of flow separation, leading to a large drag rise, as shown in the plot. The NAE team, after the Alvord desert test runs completed just a few weeks ago, are thinking of a few design changes that should help increase the cars stability and control, along with aerodynamic performance. I hope I answered your questions to your satisfaction. Thank you for your interest in the NAE project Martin and your great questions and feed back. Please feel free to contact me at my email address. But please understand I have a family and this is a volunteer project that doesn’t allow me time to get into deep details about the aerodynamics and project when responding to questions. But I will do my best. I will probably post this writeup to the NAE Facebook blog so I don’t have to rewrite it. Thanks for the follow up and explanation. One addition. Another objective running the CFD analyses with and without ground plane (without suspension systems) was to see if we had enough thrust to achieve 800 MPH for the given drag. So what the plot tells me is that our aerodynamic design of the fairings around the suspension systems is crucial in meeting our goal of breaking the current land speed record. Either that or having to stick on some oversize bottle rockets!!!! Chris, sorry about my response too. I over reacted. Hi Darren, thanks for taking the time to fill this out. I realize everything takes time. I wanted to reply days ago but have not gotten around to it! So I’m in the same boat. I do think that this is a cool story for some of the “gear heads” to know. Some of the non linearities become interesting. Plus, CFD becomes challenging because of the short falls of RANS. Important things for the general audience to know. I’m sure some of them are saying to hurry up with the attempt. And all of this, IMO (and I’m probably in the minority! 🙂 ), makes this type of design challenging, a pain, and fun.